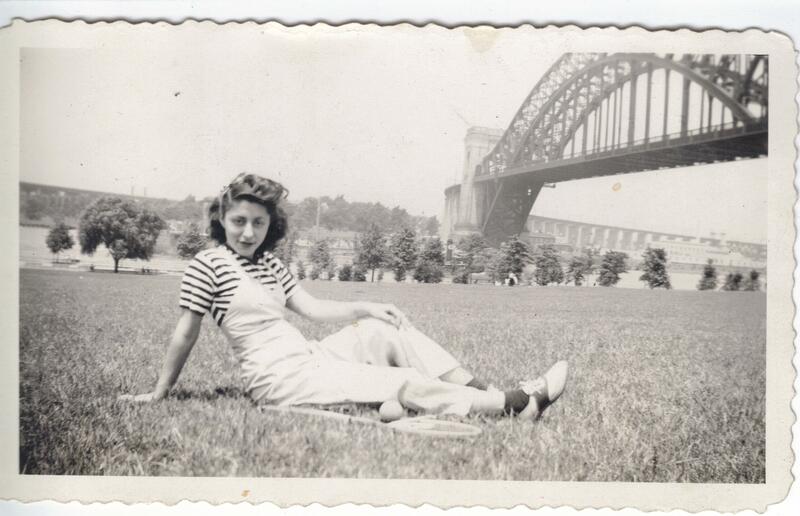 I remember my mother referring to the Triborough Bridge which connects the boroughs of Manhattan, Queens, and the Bronx in New York City. But I don’t remember her talking about the Hell Gate Bridge. It connects Astoria to the Bronx and is very distinctive looking with its masonry towers. It looms hugely in the background in many snapshots of my mother. From this bridge, I was able to place these photos as being taken in Astoria Park. 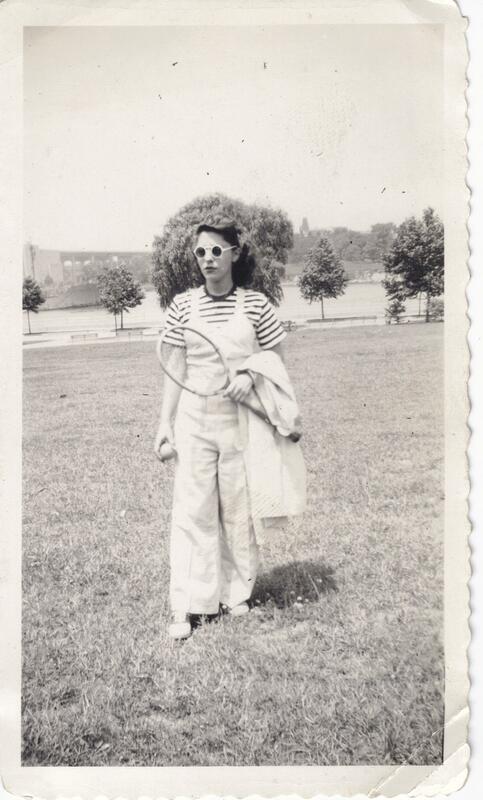 It is July 1942, and she is dressed to play tennis. She is wearing a striped shirt that appears to be a knit shirt like a polo shirt. Her white overalls are wide legged, and she is wearing saddle shoes. A long, lightweight coat is thrown over her shoulders. The top part of her hair is gathered back and blowing in the wind. The rest hangs in thick curls. The tennis racket and ball are held in one hand. I imagine the shirt to be red and white striped and that the socks are red to match. I don’t know if she played much tennis that day, or had a winning technique, but her photographer sure scored some great shots! 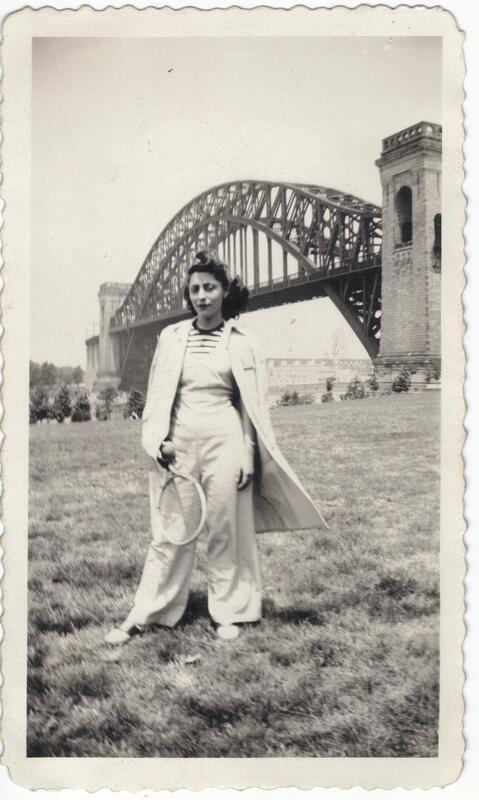 This entry was posted in Vintage Fashion and tagged 1940s women's overalls, 1940s women's sporting outfit, Astoria Park, hell gate bridge, NYC 1940s on May 30, 2013 by Stitch It Again. I watched the Great British Sewing Bee on You Tube. I enjoyed the sewing, the personalities of the contestants, and the mannerly British approach to the show. But the most influential thing to me was seeing even the seasoned contestants make mistakes. It made me realize it’s OK to jump in, cut into fabric, learn by doing, and not to worry about getting perfect results. 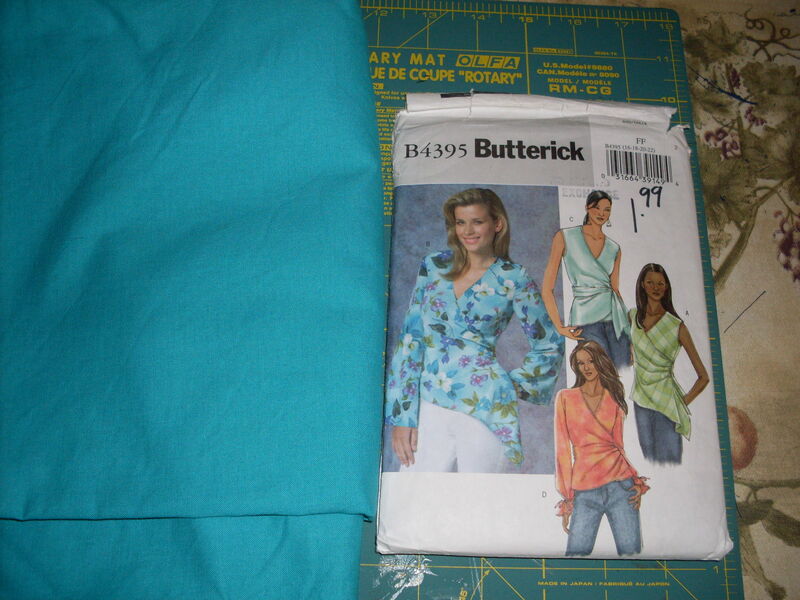 I had 2 yards of turquoise cotton broadcloth and decided to make view C, the wrap top Butterick 4395. This is my first time using a conventional tissue paper pattern. What size to make? I’m not sure if I’m a 14 or 16 because of the ease added to pattern sizes. Some pattern envelopes I have are for sizes 8-18 but this one is 16-22 so I would have to make my own changes if the 16 is too big. 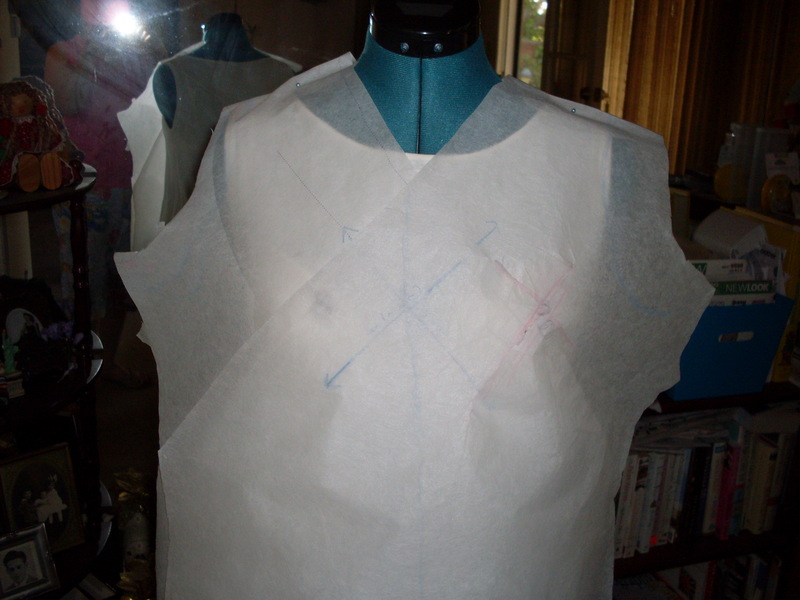 I tried tissue fitting, then I traced onto Swedish tracing paper and sewed the side seams and tried it on. I made some changes as the shoulders seemed very wide. To prepare the fabric I ripped across to straighten the non selvedge sides. 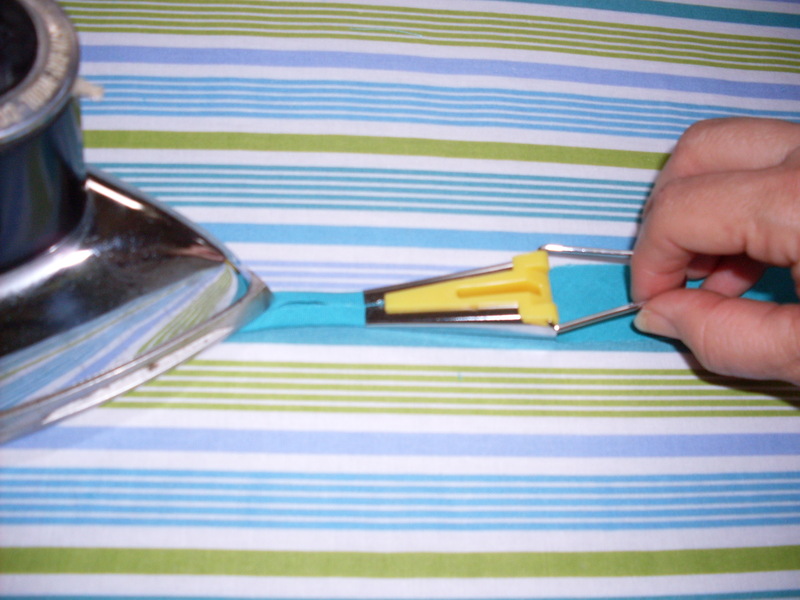 I attempted to pull a thread but I was unable to use this method as the thread kept breaking. 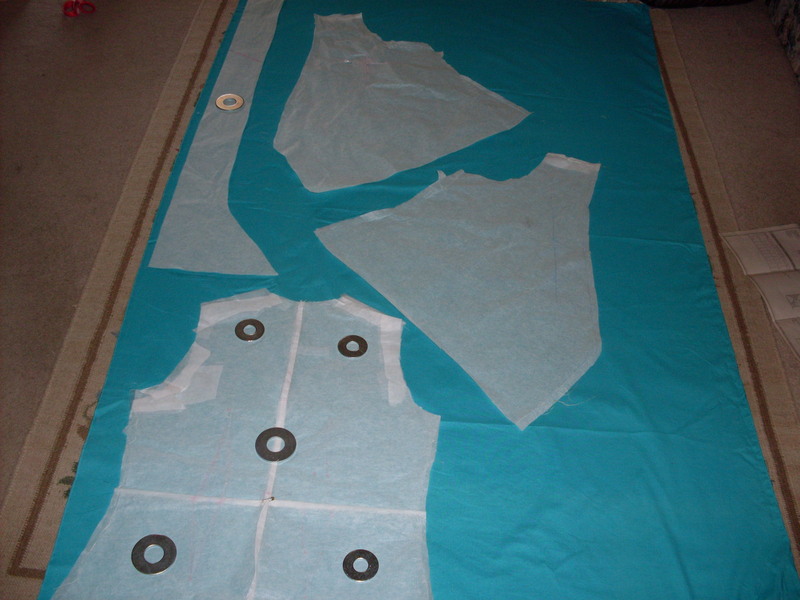 This pattern is tricky in that the two front pieces aren’t cut on the straight grain. I’m a very jerky cutter with a scissors but my rotary cutter is dull. I made my own bias binding with my Clover 1/2 inch bias maker gadget. The binding is sewn to the inside. The drawing shows the wrap ties at the waist but they attach to the bottom of the top pieces. Once I added the ties and sewed the seams I just couldn’t get it to work. One tie wrapped at the hip and I had to scrunch up the other tie to get it in the waist opening. Plus I want to stay covered and it gaped. I improvised and sewed up the wrap and added a front waist dart and two armhole bust darts. 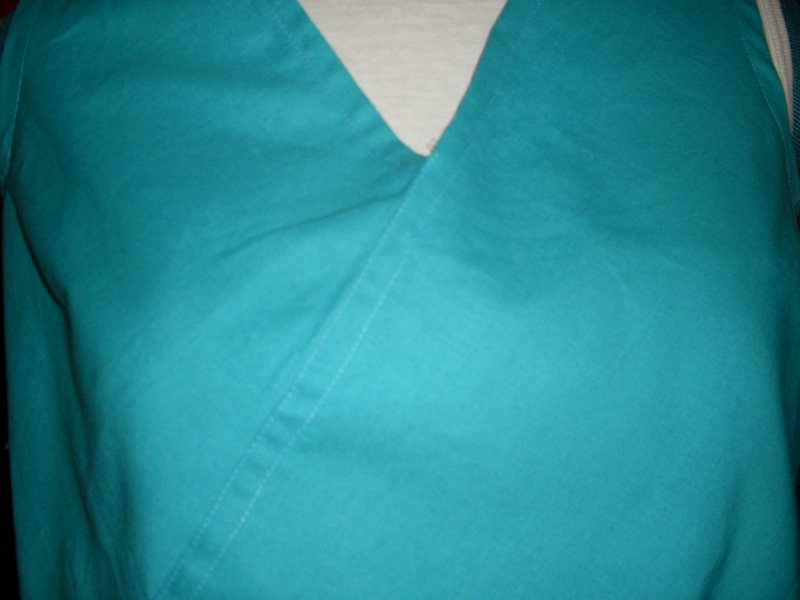 I thought it looked like scrubs or a karate top, partly because the fabric is more stiff than drapey. I considered adding trim, but decided on simplicity. It’s not perfect: it’s tight in the bust, (look at those pull lines) and strangely shaped but I’ve already worn it. It’s the third top I’ve sewn. 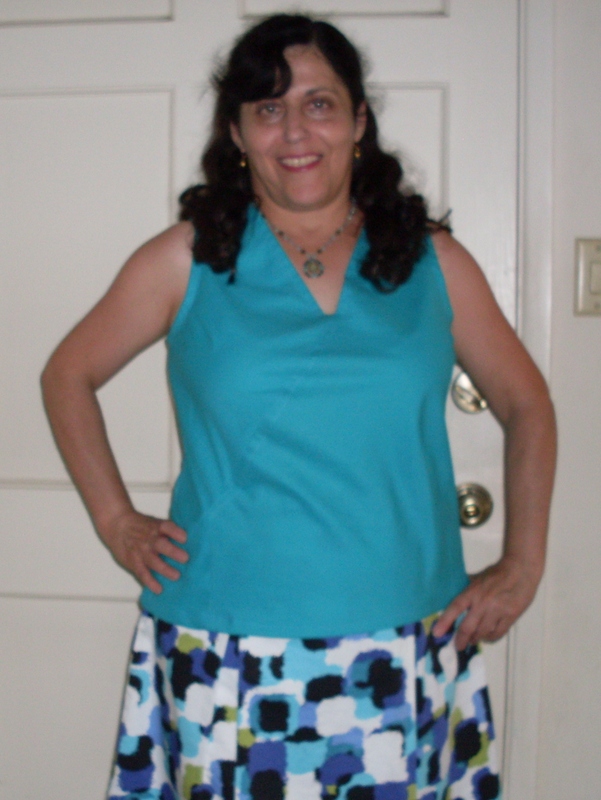 This entry was posted in Sewing and tagged Butterick 4398, wrap blouse on May 20, 2013 by Stitch It Again.